Surpassing your expectations whenever possible. Our extensive in-house resources and peerless workmanship mean we’re capable of meeting our clients’ needs. Our mandate is to surpass their expectations whenever possible. To complement our in-house expertise, we can also draw on a trusted network of architects, QS and M&E suppliers to ensure that we have additional specialist skills as required. Our service offering covers large-scale corporate, financial, leisure, commercial, and retail refurbishments. We do bespoke joinery; high speed, high tech re-fits; small projects and very large ones. The quality of our work remains constant throughout. We always deliver. If something challenges us, we’re flexible and innovative enough to meet that challenge. Shop fitting is a key service area for us. We have enormous experience – and expertise – in this service provision. We’re as adept at short timeframe shop fitting contracts as we are those that roll out in phases (according to our clients’ needs). We offer a totally bespoke shop fitting service. Whatever the requirement, we can help. Our reputation bears this out. Re-fits undertaken in busy working offices require the ability to create the minimum disruption. They can also require that refurbishment takes place out of working hours. Our discreet approach, eye for detail and flexibility make this routinely possible. Our skilled workforce has vast experience of working with Gyproc and other demountable partition systems. We are also well used to working to specific security and management demands; these may be required when a client cannot have its customers or trading environments inconvenienced or compromised. Much of our refurbishment design is creative, and executed to meet the demands of unique briefs. 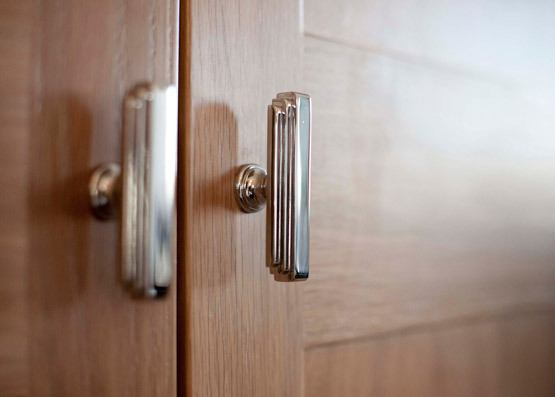 Many of the refurbishments and re-fits we do therefore require specialist joinery. Our specialist joinery service is undertaken by our joinery experts, based at our Rochester unit. Our specialist joinery service comprises hardwood shop fronts, internal doors, panelling, reception filaments, and more. Our joinery service is entirely bespoke. So just ask. We’ll do it if it can be done. As a specialist contractor with in-house skills, we have the capabilities to carry out one-off bespoke interior projects. We are experts in delivering the ultimate in quality finish with the personal touch and ensuring that the uncompromising demands of top-end luxury interiors are exceeded.